Diuretics, commonly referred to as water pills, are available both over-the-counter and by prescription. Over-the-counter varieties commonly include caffeine as one of the active ingredients, though some non-stimulant varieties include other diuretic herbs, such as juniper extract, parsley extract and couch grass root. Diuretics stimulate the body to release its excess water, making them useful for people suffering from bloating. Consult your physician prior to using any water pills. Consult your physician to discuss why you believe you need water pills. Your doctor will review your health history and determine if you are a good candidate for water pills. He will also determine if prescription water pills, such as furosemide, or over-the-counter water pills are best suited for you. Take the water pill in the morning with a large glass of water. Avoid taking a water pill in the evening, as this can cause nocturia, which is the need to wake up at night to urinate. Drink in ounces at least half of your body weight each day. For example, if you weigh 150 pounds., drink at least 75 ounces of water daily. 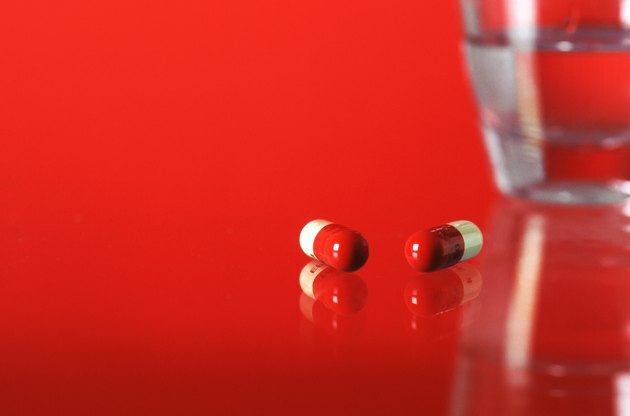 Water pills can cause dehydration; therefore, it is essential that you continue to drink an adequate amount of water. Watch for side effects associated with diuretics. These include dizziness, muscle cramps and light sensitivity. If you experience these or any other problems, contact your doctor immediately.